Latino students at a community event last year at LA Unified’s Dorsey High School. Despite making up the majority of California’s public school students, Latinos are still facing major challenges to achieving in school and graduating from college, a new report finds. But the report also highlights five bright spots in the LA County area — schools, districts, and programs that are helping Latinos succeed. In Los Angeles County, two school districts, a high school, and an early education center are modeling what needs to be done to close the achievement gap for Latino students, according to “The Majority Report: Supporting the Educational Success of Latino Students in California,” released this month by Education Trust—West. Nogales High School, one of 19 Rowland Unified School District schools, models a welcoming environment for all students, the report finds. The school provides an environment where students feel safe and connected to campus. Students script and record videos that welcome new English learners in their native languages about what to expect in the classroom and what resources are available at school. Newcomers are assigned a counselor who regularly checks in and monitors their progress. Nogales High’s Yousef Nasouf told LA School Report he has been working hard with his team during his four years as principal to provide opportunities for all students, particularly immigrants. “Some of our students are transitioning from other countries. Being an immigrant myself, I know how important it is to be in school with a welcoming environment while going through that kind of transition,” he said. Nogales High, in the city of La Puente east of Los Angeles, serves 1,950 students; 84 percent are Latino. “It’s really important to address the needs of those students, and I think paying attention to that has created an environment where they feel very much at home on our campus,” the principal said. He said the school’s quantitative and qualitative data are showing that the school is helping students achieve. According to the school’s 2016 report card, almost 65 percent of 11th-graders were proficient in English language arts and 27.5 percent were in math. In comparison, 34 percent of LA Unified’s Latino students this year scored proficient in English language arts and 24 percent in math. Also, 9.5 percent of English learner students at Nogales scored proficient in English language arts, compared with 4 percent in LA Unified. Nasouf also noted that Nogales ranked in the 99th percentile, the highest School Climate Index score, in the 2015-16 California Healthy Kids Survey (CHKS). The survey is done every two years by the state of California, and scores are based on students’ feedback about school climate. Percentiles range from 1 to 99, and that information provides a better understanding of the relationship between students’ well-being in school and their academic performance. All ninth-grade students are enrolled in an A-G approved Integrated Math I course. The district offers different course sections to support their English learners, of whom 1 in 4 is Spanish-speaking. Teachers receive specialized professional development from the Orange County Department of Education to provide specially designed academic instruction in English sections for newer English learners. At two of the district’s three traditional high schools, long-term English learners are able to take extra classes to support their learning. The district’s English learners reclassification rate in the 2016 school year was 14 percent, 1 percentage point higher than the state’s 13 percent. The report also highlights the work that Abriendo Puertas / Opening Doors does to leverage home-based care as an asset in early childhood education for Latino families. The program has resulted in parents increasingly adopting practices that enhance their children’s learning and school preparation. The Nurse-Family Partnership works across 21 counties in California to provide mothers with regular home visits from registered nurses from pregnancy through a child’s second birthday. First-time mothers learn about maintaining a healthy pregnancy and providing newborn and infant care. The program, focusing on Latino parents training each other on how to teach their children in the early years, began in Los Angeles 10 years ago and has been expanding nationwide. The Abriendo Puertas program is part of the early ed programs in 100 LA Unified schools and 30 community organizations that offer head-start programs. “Investing in early education is a guarantee of success for kids, yet too many Latino families live in deserts where there’s low or no access at all to early ed programs. We are contributing to improving that situation in the community,” Gutierrez said. Although an ethnic studies mandate was approved by LA Unified’s school board in 2014, the district has not yet made it a graduation requirement, as stated in the report. “We are moving ahead with districtwide ethnic studies, but there is not a clear timeline (to make it a graduation requirement),” Derrick Chau, director of secondary instruction at LA Unified who is coordinating the ethnic studies classes, said at a board meeting last year. José Lara, founder of the Ethnic Studies Now Coalition, along with other Latino student advocacy groups, has been working for years to get ethnic studies into every high school in the district. “I don’t know what the status is on that from the district, but I know we’ll know soon,” he said, noting an upcoming Dec. 7 community meeting when the district will give an update on ethnic studies. “I know the Mexican-American studies have been revamped in some schools, but I look forward to hearing more,” he said. Lara said his experience as a 10th-grade World History teacher at Santee Educational Complex has shown him that student achievement increases when the curriculum is culturally relevant. 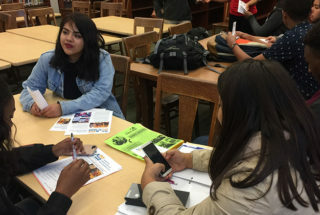 The fifth LA-area program that the EdTrust report points to as a success in helping make college accessible for Latinos is Los Angeles College Promise, a community partnership created in 2016 by LA Unified, the Los Angeles Community College District, the Los Angeles Chamber of Commerce, and the city of Los Angeles. Academic and peer supports to complete the first year of college successfully at any of the nine Los Angeles community colleges. Los Angeles College Promise has been helping to reduce financial barriers that many Latino students face attending college. It has served as an example for the state this year to create the California Community Promise program, which will provide one year of free tuition to all first-time, full-time community college students in California. Almost 44 percent of students enrolled in community colleges across the state are Latinos.